Our faculty and students are research-active, tackling some of the biggest challenges facing our world today. We encourage our students, both undergraduate and graduate, to design and conduct original research. As a major Research 1 university, IU offers a breadth of opportunities and world-class resources to support our research. Our department is well-equipped with leading-edge tools to aid in our research, including Geographic Information System and Remote Sensing mapping technology. We focus on five key subfields: Cities, Development, and Justice; Climate and Environmental Change; Food and Agriculture; Geographic Information Systems and Remote Sensing; and Water Resources. 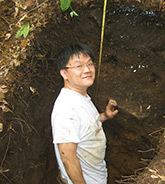 Professor Taehee Hwang is a physical geographer whose work focuses on ecohydrology, studying the relationships between hydrological and ecological systems. He is primarily working on three projects.